Album 61, Without a Hitch, has wrapped up it initial airing on radio stations (and online), and so has our review series for this latest release! 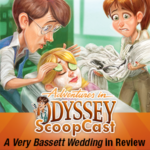 The Odyssey ScoopCast team puts a ring on their review series of Adventures in Odyssey Album 61, “Without a Hitch.” This time, “A Very Bassett Wedding” is up for discussion with the wedding of the century (okay, make it album). The team analyzes the chemistry between characters, Odyssey wedding disasters, and the final outcome of the episode.